I marvel at how seriously some people take prophets of doom. Still, I do understand the apprehension. Certainly, my own apocalyptic sense of life probably accounts for my serious side. True believers in Western religions, i.e., a Judeo-Christian-Islamic worldview, have the ‘end of times’ Judgment Day (1) to worry about. Being a Taoist lets me off that hook. In fact, Eastern worldviews overall have no doomsday grand finale, and so offer a view much closer to natural processes. All the same, I suspect a certain apocalyptic sense of life is something all humans feel, at least sub-cognitively. I see it manifested in various ways, and while not as literal or disastrous as ‘end of times’ scenarios, they are nevertheless common. (Google: List of predicted apocalyptic events and YouTube: 2011 Doomsday) For example, dramatic stock market crashes ‘foretell’ the end of the economy. The recent uptick in the extinction rate of species and global warming ‘foretell’ the end of the planet, as we know it. More recently, we had the BP Gulf oil spill and the Fukushima Daiichi nuclear disaster in Japan to stir up our fear. These events easily impart doomsday emotions, that while serious events, are not terminal. More telling is how such events can trigger cataclysmic perceptions in people far removed in time and space from actual events, or non-events as in the case of Armageddon-like stories. Believers in the Judeo-Christian-Islamic worldview and the Western worldview in general, may be especially vulnerable to apocalyptic scenarios. The Western model of creation is a one-time event. The beginning is over, whether it was a Big Bang or a God creation event. When is the end? A ‘beginning’ primes us for an ‘end’. To paraphrase chapter 2, The whole world recognizes the beginning as the beginning, yet this is only the end. It’s not surprising that serious believers get anxious from time to time. 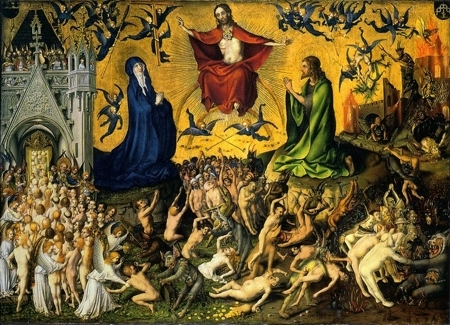 The Judeo-Christian-Islamic end of life scenario with its heaven or hell finality is a similar model that parallels the linear Western beginning – ending model. Fear lurks beneath the surface in all species. It is a survival instinct after all. (See Fear rules.) However, it is much more than that for humans. What accounts for the apocalyptic sense we share? Knowledge of our own death must lie at the heart of it. This knowledge certainly would have been among the first long-term realities humans noticed. Other social species mourn the loss of companions, but humans have an objective memory of this. We know there is an apparent end to every beginning, which makes life a much more serious affair. Knowing this, we could no longer merrily hunt and gather our days away as other animals do. As a result, both imagined and real fears drove us to ‘prepare for the future’. Indeed, our survival success as a species is partly due to this apprehension. Fear is a valuable survival asset, but it has a downside when misdirected or lulled to sleep by a civilized false sense of security. As chapter 72 cautions, When the people lack a proper sense of awe, then some awful visitation will descend upon them. A false sense of security allows us to react to trivial imagined fears, and overlook matters that actually warrant fear. Given this, it is not surprising that we often fail to act until after the fact. For instance, we don’t prepare adequately for earthquakes or for optimal health. Yet, we speed up before the yellow light turns red at the intersection. In the former we feel that “it won’t happen to me”, and in the latter we feel the fear of imminent loss… we’ll miss the light! On the other hand, having an optimistic, “it won’t happen to me” outlook can benefit survival. This, along with general ‘laziness’ hinders us from wasting even more energy on imagined and unrealistic fears — and needs. ‘Choose your battles wisely’, as they say. That’s the hitch! It is impossible to teach wisdom. Wisdom only accrues through one’s experience of making some bad choices, among other things. 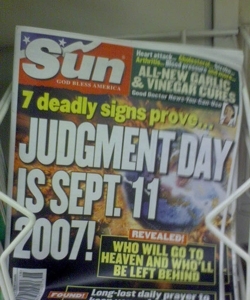 (1) The notion of a Judgment Day brings to my mind the nature of judgment. Christ said, “Judge not, that ye be not judged”. This puts the cart somewhat before the horse. The degree one judges themselves determines how much they judge others. Judgment begins within and projects outward to ‘them’. It is very humbling isn’t it? Especially as I becomes more aware of the sameness (mysterious or otherwise) between ‘them’ and me. Sure, I don’t “panic and spend my life savings” like they do. Still, the difference between those foolish and uncouth souls and myself is vanishingly small. Knowing this makes me all the more tentative and hesitant as I wade through the river of life. 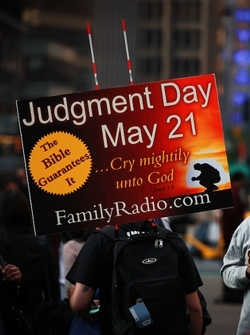 How does this Rapture prophet keep getting followers? He said it was coming in 1994, load of people panicked and spent their life savings… Then again in May this year, and the same thing happened. Now, he’s saying he’s done the maths wrong again (just like when Homer Simpson predicted the Rapture), and that in fact it’s October 21st 2011. Still, every time the Rapture fails to arrive, I’m tempted to put a pile of clothes on my garden to see if the neighbours are worried they’ve been left behind.